Enjoy the classic BBQ taste without the grill by making our BBQ Slow-Cooker Beef Brisket recipe. This BBQ Slow-Cooker Beef Brisket offers sumptuous, satisfying flavor and only takes 30 minutes to prep! Whisk barbecue sauce and flour until blended. Place vegetables in slow cooker; top with 1/2 cup barbecue sauce mixture and meat. Cover with lid. Cook on LOW 8 to 9 hours. Meanwhile, refrigerate remaining barbecue sauce mixture until ready to use. Remove meat from slow cooker; place on cutting board. Cover; let stand 10 min. Meanwhile, use slotted spoon to transfer vegetables to platter. Whisk remaining (refrigerated) barbecue sauce mixture into juices in slow cooker. Cook, covered, on HIGH 10 min. or until thickened. Cut meat across the grain into thin slices. Add to platter with vegetables. Drizzle with sauce. For best results, do not cook the meat on HIGH heat. 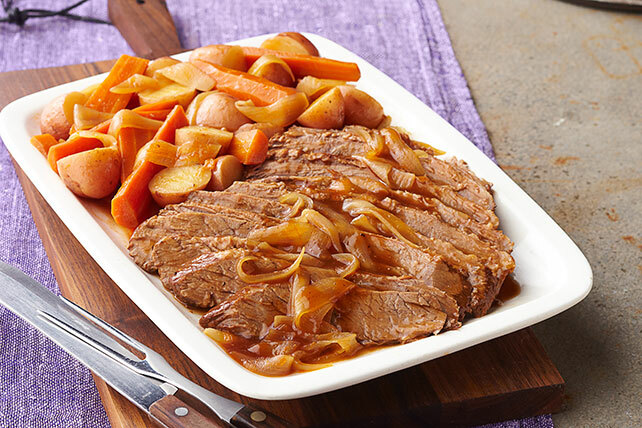 This low-sodium dish features the perfect pairing of beef brisket and carrots. The brisket provides iron and the carrots add an excellent source of vitamin A.